يشكل Le Pacifique Hotel بموقعه الممتاز في نوميا نقطة انطلاق جيدة لاستكشاف هذه المدينة النابضة بالحياة. يمكن من هنا للضيوف الاستمتاع بسهولة الوصول إلى كل ما تقدمه هذه المدينة النابضة بالحياة. يشكل هذا الفندق ملاذاَ مريحاً للاسترخاء ويمنح زواره فرصة للاستجمام والتجدد، وهو يقع على بعد خطوات من المعالم السياحية الكثيرة للمدينة كمثل: جليزي اتيتيود, ‪Aquarium des Lagons Nouvelle Caledonie‬, Aquarium. إن Le Pacifique Hotel حريص على توفير الراحة للنزلاء، فلا يوفر الموظفون جهداً في تقديم أفضل الخدمات وضمان حسن الاستقبال. تتضمن الميزات الرئيسية في هذا الفندق: واي فاي مجاني في جميع الغرف, مرافق مخصصة لذوي الاحتياجات الخاصة, واي فاي في المناطق العامة, صف السيارات, خدمة الغرف. ادخل إلى واحدة من الغرف 120 وتخلص من عناء نهار طويل بمساعدة مجموعة كبيرة من الخدمات كمثل مكيف هواء, خدمة الإيقاظ, تليفون, تلفزيون, ستالايت/ تلفزيون الكبل الموجودة في بعض الغرف. يمكنك طلب اللائحة الكاملة للخدمات في الفندق ومن بينها حمام سباحة خارجي, تدليك, حديقة. استمتع بخدمات لا يعلى عليها وعنوان ذو اعتبار في Le Pacifique Hotel . Very good but I continually complained about not having hot water in the bathroom. The last day it was hot but only lasted for a minute or so. There are water restrictions in Australia so I'm used to quick showers, but that was ridiculous. I was very unhappy about this situation but couldn't seem to get anything done about it. It was not a question of language either. They kept telling me they would sort out the problem but it never happened. I was the only occupant of the room so I didn't require too much hot water. This spoilt my stay. The hotel was good otherwise but not sure now if I would recommend it because my problem was never sorted out in the four days I was there. The stay at this hotel was very pleasant, hotel staff were very friendly and helpful and the view from our room was amazing. Public transport and restaurants were very close. We had an issue with the plumbing in our hotel room and as soon as the staff were aware of this we were moved and upgraded to another room within 5 minutes. Would stay here again. The room are very noisy, aircon is very old and bathroom no so clean. We stayed two nights in Noumea on our way from Vanuatu to Tahiti. 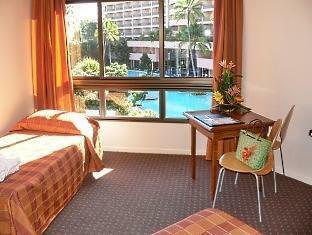 The hotel was the perfect starting point to explore Noumea within the short period. The convenient and clean room and the very comfortable bed made the stay a recreative stop on our world trip. Pool was the best thing about the hotel. It's shared with other hotels (two more) in a central location (Nouvata Parc complex) and it was mostly clean. Could have used a bit more seating, as during the busy time it was almost impossible to find a chair. I saw a lot of people spread their towels on the cement/floor. The room was basic - it was two beds (double and single), small fridge, hot water heater, microwave, and sink to wash the plates and silverware. Plenty of closet space for folded clothes (three people's clothes fit). But we ran out of hot water in the shower as the shower water heater was above the toilet and after about 10-15 minutes it was used up. They have a string to hang up wet clothes in the shower, as well. We actually used a lot less clothes (than I expected) as we washed some of them in the shower/sink and then hung them, allowing us to reuse some. As you're a 2-minute walk from the bottom floor of the hotel to the beach, you can't beat that. Great view from the top floor of the ocean and far away islands. You're a bit far from the city center, but if you get up early and take one of the city tour buses (where you can hop on and off at each of the locations), it's fun. You just have to be sure where the bus stops are - they can be confusing. Also, knowing French when you go to the hotel is not necessary, they have English staff. You will have problems with some of the local restaurants who reminded me of Parisian waiters. They ignore you until they FEEL like getting to you and they act like they are above you, but I did not feel that way at the hotel. The hotel restaurant I did not eat at, but the Chinese food place on the bottom floor (outside of the hotel) was really good (small portions), although expensive (Mayflower restaurant). But all places in Noumeau are expensive ($20 for a footlong sandwich but don't think Subway, think a real skinny French bread with a little bit of meat and sauce, that's about it). This is an older hotel within the Nouvata Parc Complex but still perfectly comfortable. I had an ocean facing room, which was brilliant - the only downside being the nightclub on the jetty which is not far away. The bathroom was spacious and clean, but the hot water was limited. I loved it all, it was an amazing time, the staff were brilliant, made our trip even better, loved the night life, the bar at the hotel had the best service and I would love to go back again sometime soon. Very attractive complex. lovely pool, good facilities. we were upgraded to le parc in the same complex because when we returned after 24 hours away from noumea, they could not find a room which was non smoking or which had any view. our room in le parc was excellent but we were woken in the night to an intruder in our room. he was one of a team of 6 who had checked in to the hotel and despite the fact that we called reception, the response was minimal and the next day the day manager knew nothing of it and at that point the intruder was still in the hotel. nothing was taken fortunately and the day manager called the police. our concerns were, that a hidden opening on a ranchslider had been left open. our advice to future guests is to be very vigilant about all aspects of security. We stay Saturday and Sunday. So most of shops are closed, but in front of our hotel, many shops are opened. But at night, there is no taxi. Only it, we felt inconvinient. Other things are no problem.